1 x DST Backpack, 1 x DST Mug, 3 x Limited Edition DST Collector’s enamel pins, 1 x DST Baseball Cap, 1 x Limited Edition DST collectors card, 1 x Limited Edition DST signed collectors card (actor not at event), 1 x 10"x8" pre-signed Destination Star Trek photograph (actor not at event) †, 1 x 16x12” DST event poster, 1 x Souvenir Programme, 1 x DST Lanyard, and a selection of exclusive DST merchandise. * Details of the meet and greets will be communicated via email closer to the event. * Captain Seating in the main talk hall will be located behind the Admiral Seats, and ahead of all other package/ticket types. Priority seating is subject to early arrival prior to ticket holders being seated. In the event that you arrive once Captain Seating has already been done, our crew members will find you the next best available seat in the hall. We would strongly advise early arrival to all talks, no Captain Seating is guaranteed and is dependent on being in the queue when that area is seated prior to the talk starting. 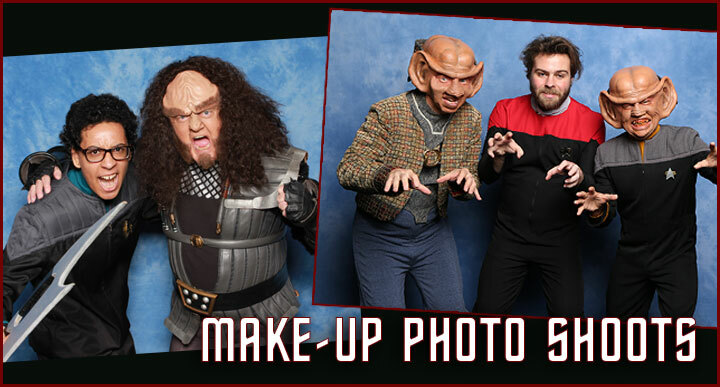 ***Prior to the event the organisers will reveal which guests are included in your Captain package for photo shoots. The pre-assigned photo shoots will be to the value of 1 x tier one guest and 1 x tier two guest. You will be given 3 x £15 vouchers to be used for individual guest photo shoots with guests of your choosing attending on Friday, Saturday or Sunday, who are charging £15 per photo shoot. Vouchers can NOT be redeemed as a partial payment against photo shoots of a higher value than £15. Captain badge must be presented when using vouchers. 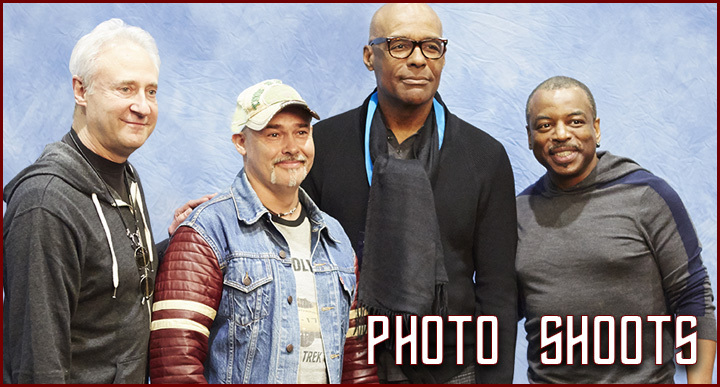 **Prior to the event the organisers will reveal which guests are included in your Captain package for autographs. The pre-assigned autographs will be to the value of 1 x tier one guest, 1 x tier two guest. You will be given 3 x £15 vouchers to be redeemed for in-person autographs with guests of your choosing attending on Friday, Saturday or Sunday, who are charging £15 per signature. Vouchers can NOT be redeemed as a partial payment against autographs of a higher value than £15. Captain badge must be presented when using vouchers. ~ At the time of booking you will be asked to choose a group number for your talk allocation. Each individual ticket holder has a choice of which group they wish to be in. This can be different to other tickets in your order but if you want to sit with friends or family who also have tickets please select the same group letter for talks. If your friends or family purchase tickets at a different time to you, be aware that each group letter has a set allocation of tickets, and this group may not still be available at a later date. Once you have selected a group and completed the transaction you will not be able to change this selection. Closer to the event the Organisers will reveal which ‘Paid Talks’ are included in each group. 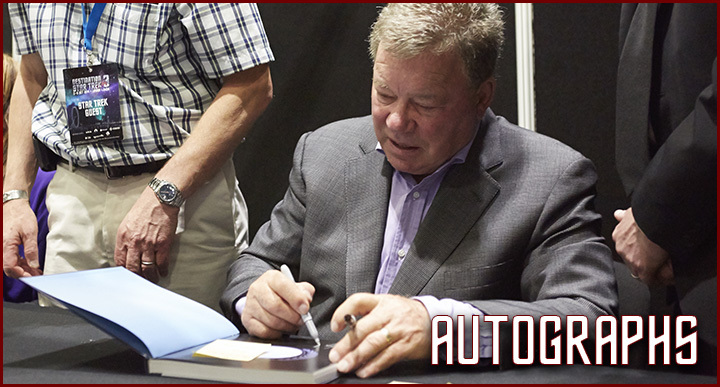 ^ Fast Track passes for autographs allow the customer to join the back of any queue for autographs without a VQ ticket, subject to queue capacity (you may be asked to return at a quieter period). Captain Package holders will need to make themselves known to our crew members when joining the queue. Fast Track passes for Photo Shoots - prior to the photo shoot starting, you will need to make yourself known to a crew member who will assist you and place you behind the Admiral Package holders but in front of all other ticket holders. In the event that a photo shoot has already started a crew member will place you in the best available position in the queue as close to the front as possible behind any Admiral ticket holders.